It all starts this Monday. Are you ready? Are you excited? I am; I hope you are, too. Debi posted in the Facebook group about keeping in mind the Why of your participation in the Bible in 90 Days event. Reading the Bible in 90 days can be a challenge, especially for those who don’t read a lot or who don’t read fast (like me), so remembering why you’re doing it can be a great help in getting through it. For me, I’m doing it again for some of the same reasons I did it in 2014. For a few years now, I’ve tried to find ways to challenge myself in some area of discipline. I went a whole year without coffee once (that was really hard). I went a couple of months without chocolate (also not so easy). Debi and I are attempting to go 2016 without eating pizza (unless we’re offered it in a fellowship situation). * Reading the Bible in 90 days is a challenge that takes discipline to keep at it, and I want to challenge myself with that. I enjoy studying the Word of God in its details. I love doing a passage-by-passage study with my friend each week. I love doing word studies. If I allow myself, I can easily spend long periods of time on a word or phrase with cross references, quotes, and allusions. But it’s easy to get lost in the trees, as the saying goes. Reading the Bible in 90 days forces me to regain the big-picture, high-level overview of the one story of God in Scripture. I love doing things with my wife. I like that it adds to the camaraderie that we already experience as a married couple. She’s the best partner there is for something like this; I wouldn’t miss this for anything! So, those are some of my reasons for participating. What are yours? If you’re not clear on what this is all about, you can read this brief blog series about it. If you’d like to join us, you can do so easily by joining the Facebook group or, if you’re not on Facebook, by asking to be added to the email list (you can leave me a comment here or get in touch with me in any other way). I sincerely hope you will—it can change your life. * Do you notice the theme of food in my list of disciplinary exercises above? Food has always been a struggle for me, so while not all of my discipline challenges are related to eating, many of them are. It’s not just that I’m hungry while writing this. I originally posted this on January 25, 2014 in preparation for my first ever Bible in 90 Days. As with the previous reposts this month, I’m hoping that this will help convince someone that they can read through the Bible in 90 days and that there are several worthwhile benefits of doing so. I also reposted and updated a few tips that I hope will help someone get through it successfully. In this repost (edited for 2016), I want to give the play by play of how I read through the Bible in 90 days back in 2014 and how I hope to accomplish it again this year. I’m a slow reader, so this is a particularly difficult endeavor. My wife reads a million words per minute (that’s a rough estimate), so while it’s still a challenge, it’s really not too difficult for her. I read only slightly faster than a normal conversational pace, which is pretty slow for reading. As many of you know, there’s a group of us who intend to read through the entire Bible in 90 days starting February 1st. You can read more about it here, including how you can join us. Last time, I decided that the best reading plan for me was to just start at “In the beginning God created the heavens and the earth” and read like crazy. This time I’ll be reading straight through books, but I’ll be changing the book order a little bit. I’ll be using the book order that is in The Books of the Bible which I think is an interesting arrangement (click the link to see it on Amazon and see the order of the books there). I will be using my ESV Reader’s Bible on Kindle for the actual reading, but I’ll be reading the books in the order of The Books of the Bible. For me, using one of the schedules that has dates for each reading will probably be a drag if I find myself getting behind. Also, I don’t want to give myself permission to stop reading if I finish that day’s scheduled chapters, if there’s still time left to read. I know that there will be days when life will get in the way and I won’t read as much as other days, so my plan is to just read and read and read! 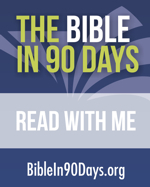 The official Bible in 90 Days NIV Bible has a straight-through reading of 12 pages per day. So, basically, wherever you are after 12 pages, you’re finished for that day (of course it stops short or long so as not to stop in the middle of a sentence). This eliminates counting chapters or verses which vary so widely in length. So, how do I intend to plan my days from February 1 through April 30 this year? – I read 2-3 chapters from the Bible to start off my morning—based on whatever plan I’m using at the time (this is followed by my prayer and Bible study time). – I read from Proverbs and Psalms around 10:30 each morning (that’s my work‘s unofficial coffee break time) or around 12:15 during lunch. – I read books and articles each evening for an hour or two before going to bed. – Read 2-4 chapters from the Bible to start off my morning (followed by prayer and study time). – Read a few chapters in the place of Proverbs and Psalms at the unofficial coffee and lunch breaks at work. – Read as much as possible in the evenings. – Read whenever I find myself waiting in a drive through or any other time I can. I do have a couple of things I am obligated to read and I can’t neglect those, but for the most part I’ll be reading the Bible. Though I’m not willing to guarantee I’ll be able to finish in 90 days, I’m excited to try this again. I also have a high level of confidence that I will complete it in time because I’ve done it once before. But, if April 30 comes and I’m not done, I’ll keep up the same schedule until I am done. The rewards will be the same whether it’s 90 days or 100 days or 110 days. The worst possible thing for me to do is to give us before I’m finished! I know for a fact that if I, as a slow reader, can read through the Bible in 90 days, so can you. If you’d like to join us, you are more than welcome. I hope you will. This was originally posted on January 18, 2014. Since we’re about to begin our next Bible in 90 Days, I wanted to repost this. I’ve edited it to reflect the current dates. Starting in a few weeks, a group of people will begin reading the Bible at a pretty good clip. We will be reading through the entire Bible, either straight through, chronologically, or by using whatever plan each person prefers, in 90 days, and we want you to join us. The schedule is February 1 – April 30, 2016. Honestly, I don’t think I’ve ever read the Bible straight through in a year either despite several failed attempts. I’m a slow reader and I easily get bogged down in some portions of Scripture. But there are a few reasons why this is different. First off, 90 days is a much easier commitment than a year. I find it much easier to think about keeping up the pace for 90 days than for an entire year. For a 3-month commitment, the end is in sight as soon as you start. Doing it with a group helps keep me accountable. We won’t all be at the same place each day, but we can post or email our progress for encouragement and accountability. Having a set start date that’s not January 1st gives me a sense of mission. This is much more subjective, but I’ll admit that I need that type of motivation. With these differences in mind, I’m excited to get started. I know I can do it because I succeeded the first time we did this back in 2014 (we’re doing this every even year), so I have high hopes that I’ll be able to accomplish this challenge this time as well. I know you can, too! For me, I like that this forces me to see the whole story of the Bible from a very high altitude. I usually like getting down to the nitty gritty details of words, word origins, how the author intended to use this word in that verse for that circumstance, etc. That’s a very rewarding way of studying the Bible, but I can easily lose sight of the forest for the trees (and branches, and leaves, and spongy mesophyll, and cells, and pieces of cells, and the pieces of those pieces, ad nauseam). Reading the entire Bible in such a short period of time forces me to see that “forest” again. Others have mentioned how it forced them to grow in discipline. It has done this for me as well. There are also testimonials of those who say that doing the Bible in 90 Days challenge has forced them to see context they’d never noticed before. Some have also said that it made the “one story” of the Bible so much more clear. I’m looking forward to April 30 (hopefully) when I finish reading Revelation 22. I can picture myself tired but satisfied, enjoying these benefits of having accomplished this. So, are you excited to try it? I hope you see that, though it is a time commitment and it is a challenge, it’s an achievable challenge that comes with many benefits. You can join us by simply asking to join! We have a Facebook group (click here) if you’re on Facebook, or give me your email address and I’ll send you everything you need. Simple ask me to add you to the group or the email list and I’ll be happy to do so. The only thing you have to do is read the Word. If you want to join in on the discussions, you are free and welcome to do so, but there are no 2-hour sessions or classes to join, etc. Just read the Bible! I think joining the group will benefit you with encouragement and accountability, but you don’t have to. If one of your New Year’s resolutions is to spend less time in front of the TV or to be more consistent in reading the Bible, this may be a really good step in keeping it. I hope you’ll join us. I posted some tips about how to keep going when the reading pace gets tough, and I’ll be reposting those again soon. I hope you find them helpful. I sat in on part of our church’s middle school discipleship group last night and I have to brag on them a little bit. Spurgeon said, “Whether we teach young Christians truth or not, the devil will be sure to teach them error.” Our youth pastor, Joshua Haynes, teaches our young Christians truth. Last night he was teaching these kids about studying the Bible. He was teaching these middle schoolers inductive study methods. How cool is that! And he wasn’t just teaching the basic 3 principles—Observation, Interpretation, and Application—hoping that they’d someday be able to put them into practice, you know, when they got older and more serious about studying Scripture. He was digging deep into what these principles mean, why they’re important, and how to do them. And the kids were really digging it. They are still on the first principle, Observation. The pastor had my wife, Debi, come in and speak a bit about observation, and to give a demonstration that she has given to the adult ladies at our church a couple of times. She had multiple items on a tray and asked the kids to write down as many observations that they could about what they saw in 2 minutes. She then used the items to show that what they see at first glance might turn out to be different upon further reflection. This ties into good observation skills when studying the Bible. Pastor Joshua then talked to them about the 5 Ws that we should all be asking of the text: Who, What, When, Where, Why. He broke each one down and gave examples of how they could use each question. Afterward, he broke them into small groups and had them practice this on a passage of Scripture. I am so excited that our youth group is getting such great training by Pastor Joshua and his volunteers. So often churches will try to dumb down good solid teaching to younger teens, but I think that’s a huge mistake. Kids are smart, and they can grasp these concepts. Some of it may end up being a challenge for them, but that’s certainly not a bad thing. I feel certain that these kids, under this type of training, will soon be better prepared to properly study Scripture than many adults in many churches today. It would benefit us all to learn the same study techniques and to put them into practice daily as we seek to know God’s Word and glorify him as a result. Starting in two weeks from today, a group of people will begin reading the Bible at a pretty good clip. We will be reading through the entire Bible, either straight through or chronologically, in 90 days, and we want you to join us. The schedule is February 1 – May 1, 2014. With these differences in mind, I’m excited to get started, and I have high hopes that I’ll be able to accomplish this challenge. For me, I like that this forces me to see the whole story of the Bible from a very high altitude. I usually like getting down to the nitty gritty details of words, word origins, how the author intended to use this word in that verse for that circumstance, etc. That’s a very rewarding way of studying the Bible, but I can easily lose sight of the forest for the trees (and branches, and leaves, and spongy mesophyll, and cells). Reading the entire Bible in such a short period of time forces me to see that “forest” again. Others have mentioned how it forced them to grow in discipline. I’m looking forward to May 1 (hopefully) when I finish reading Revelation 22. I can picture myself tired but satisfied, enjoying these benefits of having accomplished this. 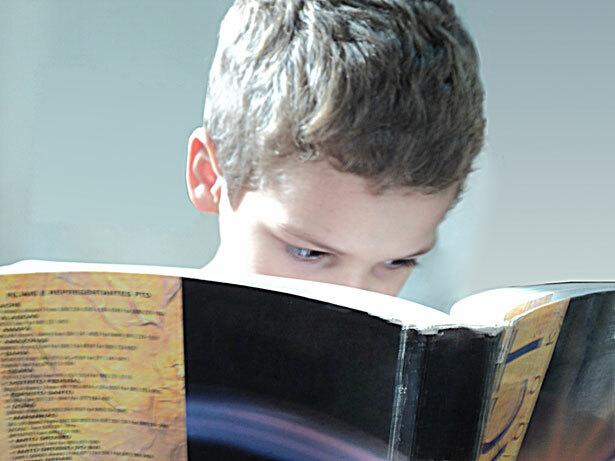 I plan to post posted some tips about how to keep going when the reading pace gets tough. I hope you find them helpful.